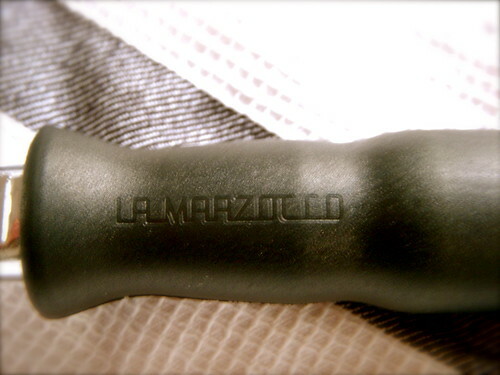 In the process of trying to experiment, I logged onto La Marzocco’s website and was pleased to see that they now have an online shop, where you can order lots of stuff including what I was looking for, a bottomless La Marzocco porta-filter holder (more of that to follow in my next post God willing). In any case, I was happy to learn that they now have a dealer in Vienna, Austria – where I live, and so got in touch with the dealer. In the meantime, I managed to exchange a few e-mails with La Marzocco, informing them about my website naturally, and I am pleased to say that they were impressed with my website and encouraged me to keep up the good work – OK ! now I’m feeling a bit water eyed (i.e. tearful) because, for a company like La Marzocco – makers of probably the best espresso coffee machine in the World, who of course know a lot about coffee -to say something like that, I was really touched. In any case, I am pleased to report that I managed to get my La Marzocco bottomless porta-filter and it fitted perfectly into my Isomac Venus, in fact it fitted much better than the original, so naturally I am very pleased. The Austrian dealer tried to encourage me to get the one and only La Marzocco machine made for the home – the GS3 (the rest are for professional or commercial purposes only), but when I gasped at his special price for me only of €2,500 (a cool equivalent of about $3,500) – Now on this occasion, I am happy to say that the price of this machine is cheaper than in the US, which I just saw was retailing for about $7,000. It’s worth a coffee fanatic coming over to Austria and buying the machine and taking it back home and still saving money. In any case for more about this machine read the very extensive review on Home Barista http://www.home-barista.com/pros-perspective-gs3.html. Visit www.lamarzocco.com for more about La Marzocco. This entry was posted on Sunday, June 8th, 2008 at 5:31 pm	and posted in Uncategorized. You can follow any responses to this entry through the RSS 2.0 feed.